Metric Concrete Construction & Design Inc. performs basement remodeling which is one of the most effective and affordable ways to increase your living space as well as providing a high return on the home investment. 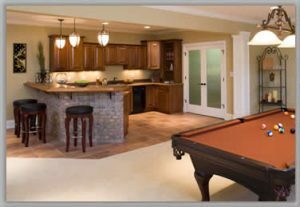 Just as kitchen and bath remodeling, basement finishing makes homes much more attractive to potential buyers. Metric Concrete Construction & Design Inc. provides stamped and poured concrete services to the entire Philadelphia, Delaware and South Jersey area including: Philadelphia, Delaware, Chester, Montgomery, Bucks counties in Pennsylvania and Gloucester, Burlington, Camden, and Cumberland counties in New Jersey as well as New Castle and Kent counties in Delaware and all other Delaware Valley areas.